Hey all! Today I’m starting a weekly series here called the Sew Saturday Snippets. My hopes are to share some of the videos, makes, and other things going on in our sewing community and also catching you up on any of my work that I’ve been up to. I’d love this to be the kind of grab a cup of sit down to read with a cup of tea or coffee on your Saturday morning to fuel your creative efforts for the day. If you would like to be featured in an upcoming Sew Saturday Snippets, please shoot me an email: elizabethmadethis@gmail.com. Here’s the inaugural post! I made this DG Patterns Tessa sweater dress from a baby pink chenille knit. Not content with the ho-hum nature of the fabric, I dyed the whole dress and found myself with a different creature altogether. 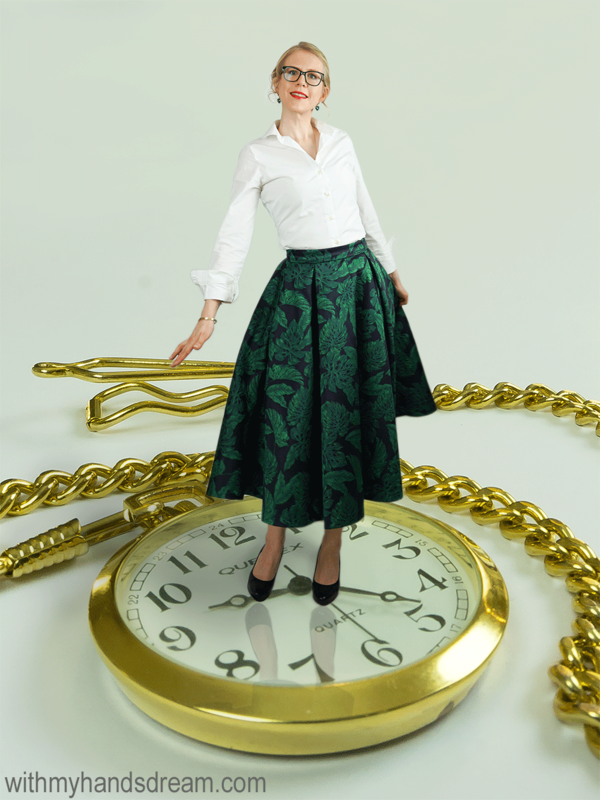 Katja made a really cool Burda 6650 skirt from a gorgeous deep green jacquard. The vintage vibe and the amazing body of this jacquard is so beautifully dramatic! June made a fantastic Papercut Patterns Sapporo coat from a pink and white jacquard wool coating. 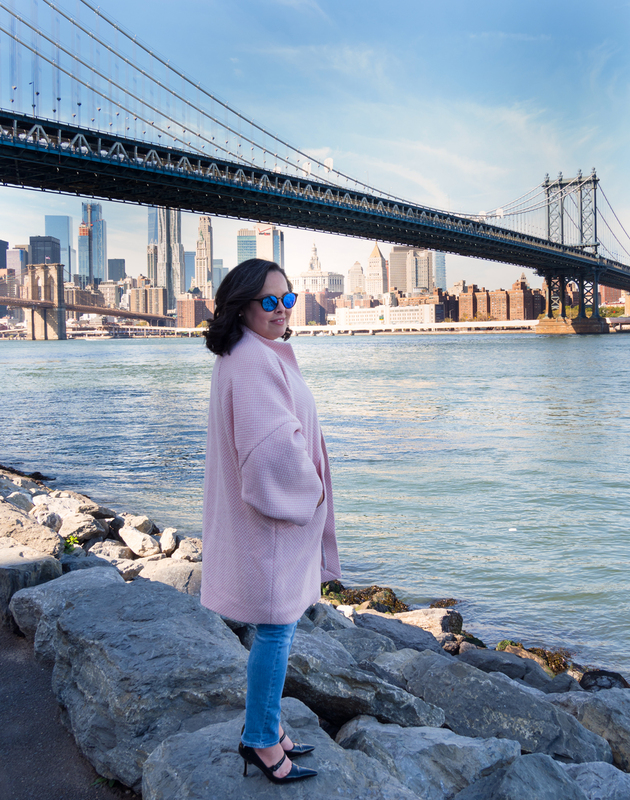 The mitered corners are razor sharp, and the whole coat is cotton candy and joy! Justine stitched up a Butterick 6169 cozy blue sweater knit motorcycle jacket and lined it with sherpa. I can imagine a walk in the woods being such a treat in this jacket. Rosy sewed up her new Laura top pattern in a deep red stretch velvet perfect for the holiday season. Renata is sharing her planning process for her Little Red Dress Project that she’s hosting this month. People, I don’t wear red, but I’m so inspired by all of the work that she’s put into this, that I have to jump in! Rosie from Sewn is her lovely co-host. One Week One Pattern has just finished up. This challenge encouraged sewists to share pics of one pattern styled or sewn different ways for a whole week. It was personally fun to see how often I’d used my favorite Jalie 2921 t-shirt pattern to create totally different styles. and LauraLexington for her NewLook 6000 piece of vintage perfection. That Sewing Blab had a fun holiday party show that featured some sewing community members and a collection of very silly Santa hats. I started my Handmade Holidays series where I’m showcasing quick and simple sewing projects for anyone and everyone on your gift list. Check out the easiest way to make an elastic casing, the fastest way to make zipper bags, and sweater refashions into a capelet, and also fingerless gloves that’ll leave you with nice cozy thumbs. Lizzie made up a round of holiday gifts including a really sweet bunting Advent calendar. IndieSew introduced us to Christine Haynes’ Varda dress in their new pattern spotlight series. Can I say how cool it is to see a pattern move on an actual person right next to the line drawings? Love. It! What have you been sewing up this week? I love ALL of your posts. You are so talented and humble! I think it’s great the way you promote as well other sewists projects. Look forward to keep learning through your posts. Thank you Elisa! I’m looking forward to this series! Thanks for reading! I’m so happy to do it June! Your coat is just beautiful and a great inspiration piece for those of us wanting to make coats this year! What a fun idea! It’s nice to get the video highlights too, since my time to watch those, or even look for those, is rather limited. Thanks Becky! I agree about video–it’s tough to carve out the time! I’m looking forward to exploring more of what’s out there if for no other reason than I can keep up with people! Thank you for including me and my skirt! Absolutely Katja! Your skirt is a portrait of vintage perfection! You are just a joy to Know 🙂 Thanks for including me in this awesome series! Aw, thanks Renata! I’m so glad to. I hope there’s tons of red dresses out there! Thanks for including my Little Black Dress entry! It was a very fun project. Absolutely Laura! That’s such a pretty dress–you did such a beautiful job on it!